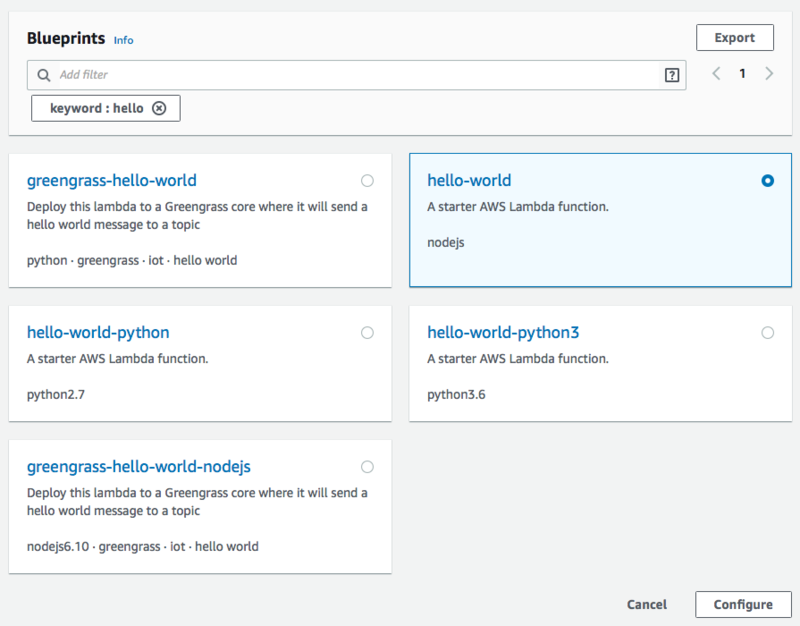 This solution uses a Lambda function to update customers' endpoint records based on the preferences that they provide on the web form. This section shows you how to create, configure, and test this function. Later, you set up API Gateway and Amazon Pinpoint to execute this function. The first function takes input from the preference management web form, which it receives from Amazon API Gateway. It uses this information to update the customer's endpoint record according to the preferences that they provided on the form. Under Create a function, choose Blueprints. In the search field, enter hello, and then press Enter. In the list of results, choose the hello-world Node.js function, as shown in the following image. Choose Configure. For Name, enter a name for the function, such as EmailPreferences. For Existing role, choose the EmailPreferencesForm role that you created in Step 3.2. When you finish, choose Create function. In the first row, create a variable with a key of projectId. Next, set the value to the unique ID of the project that you created in Step 1.1. In the second row, create a variable with a key of region. Next, set the value to the Region that you use Amazon Pinpoint in, such as us-east-1 or us-west-2. When you finish, the Environment Variables section should resemble the example shown in the following image. At the top of the page, choose Save. After you create the function, you should test it to make sure that it's configured properly. Also, make sure that the IAM role you created has the appropriate permissions. For Event name, enter a name for the test event, such as MyTestEvent. In the preceding code example, replace the values of the endpointId, firstName, and lastName attributes with the values for the endpoint that you imported in Step 2. Under Execution result: succeeded, choose Details. In the Log output section, review the output of the function. Make sure that the function ran without errors. On the All projects page, choose the project that you created in Step 1.1. In the navigation pane, choose Segments. On the Segments page, choose Create a segment. In Segment group 1, under Add filters to refine your segment, choose Filter by endpoint. For Choose an endpoint attribute, choose NewProductsOptStatus. Then, for Choose values, choose OptIn. The Segment estimate section should show that there is one eligible endpoint, and one total endpoint, as shown in the following image.